August 1453 and the Wars of the Roses slide into violence as the two great families of the far north – the Percys and Nevilles – clash at a Neville wedding. A mistake by the Percys. Two years later, the House of York gains control the fate of the House of Lancaster after Richard of York wins the first Battle of St Albans, and becomes Protector of the sleep-walking Henry VI. Fighting alongside Richard of York were his brother in law, Richard Neville, Earl of Salisbury, head of the Neville family, and Salisbury’s son, the young Richard Neville, Earl of Warwick, whose manoeuvres through the back streets of St Albans were key to the Yorkist’s success in the battle. These three Yorkist Richards made for a powerful trinity…. but fate is fickle, as Richard of York and his allies discover at Sandal Castle – aka the Battle of Wakefield. 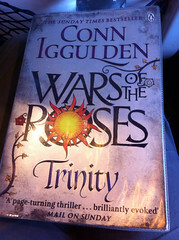 Series: Wars of the Roses, book 2.